For most of the home improvement or remodeling projects, bathroom renovation is a major component. And why not! It is a major section of any home and a place, where you can relax and refresh. It is probably the very first section of your home that you visit just after leaving the bed in the morning and prepare yourself for the whole day. Similar to kitchens renovation, marble vanity tops and bathroom worktops are not just functional, but are a major component of the overall design. Selecting the right stuff for vanity tops is not an easy task. Before choosing a material for your bathroom it is necessary to consider best available options in the market for vanity tops and individual properties of those materials. 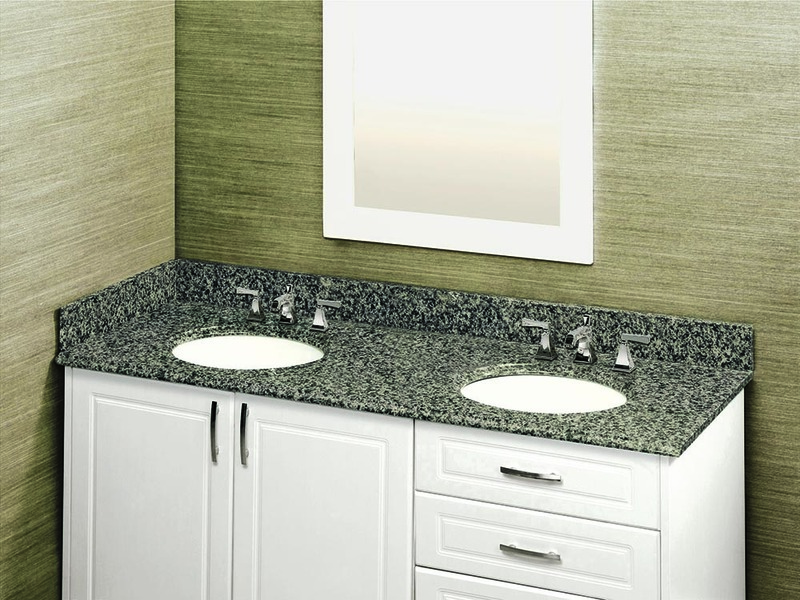 This will help you make right material choice for your granite or marble vanity tops. 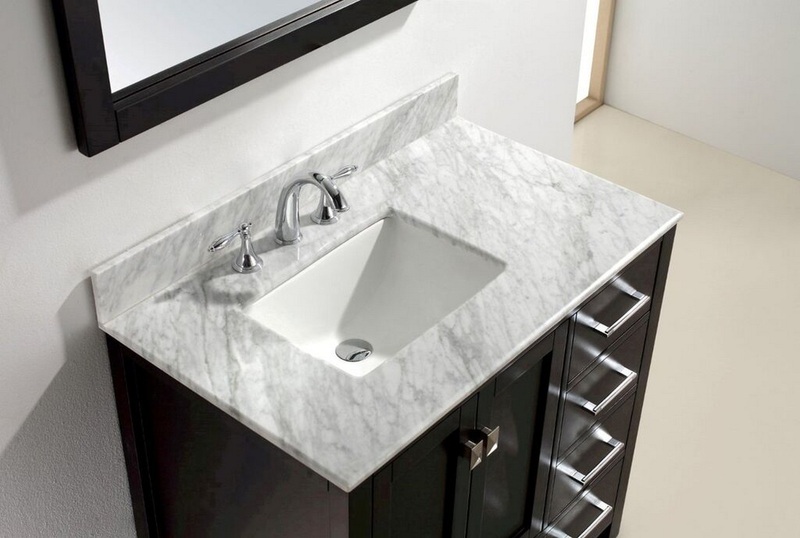 An ideal vanity top should bear just the right balance of aesthetics and functionality; depending on their choice and requirement as well as your lifestyle. It is probably one such area of your home that observes heavy traffic daily, even many times a day. It also gets exposed to various stuffs like water, soap, detergent, cosmetics and cleaning agents. It is therefore necessary to make a right choice of bathroom vanity top material, so as to keep it functional and aesthetically appealing for long. Below discussed are two most popular natural stones, used to create vanity top, along with their advantages and disadvantages. 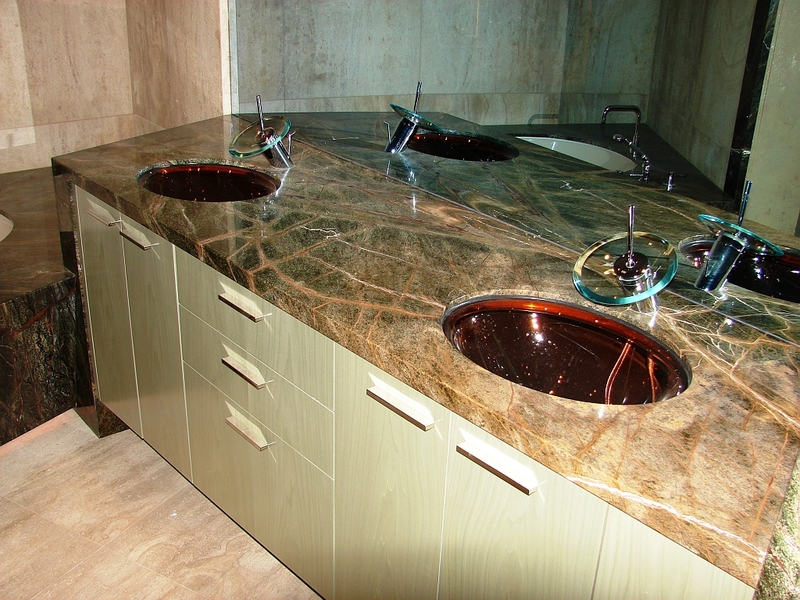 An extremely beautiful natural stone, marble is a fairly popular material for bathrooms vanity tops all over the world. Marble tiles or slabs are usually employed to develop a bathroom countertop. It is available in shades of white, pink, green, brown, etc. with dynamic surface patterns in the form of waves, streaks, swirls and flecks that collectively contribute to its elegance and naturality. Advancements in marble processing techniques, has now made it available in different designs, shapes and finishes that add to its enticing looks. Every marble slab is unique and adds considerable charm to any space inside homes, be it living room or bathroom. Cooling Effect: It naturally helps keeping the bathroom cool, which is in fact perfect for bathroom environment, where hot liquids and showers usually raise the bathroom temperature. Makes the Bathroom Look Spacious: The light and natural tones of marble, makes the bathroom appear more spacious than actual. Also, it helps in creating a clean and calm space to freshen up before you starting your day or to revive after a long, hectic day. Easy Maintenance: Marble vanity tops can be easily maintained. You can easily clean the marble surface by using a soft cloth and mild soap solution, if necessary. Staining Issue: In comparison to other natural stones like granite, marble is more porous. Due to this reason, it readily takes in unwanted oils and liquids that expectedly or accidentally spill on its surface and lead to marble staining. So, it is recommended that one should be attentive while using cosmetics and acidic substances on a marble vanity top. Proneness to Scratches: Marble is relatively a soft stone and hence, gets easily scratched. Hence, you should be very careful while using sharp or pointed objects on a marble surface. This is perhaps one the most durable stones and extensively used as kitchen as well as bathrooms countertops; usually in the form of granite slab or tile. It has vast range of colors options to choose from that varies from white, grey, black to blue, red, green, pink and yellow. It has very dynamic surface patterns that appear as swirls, waves, streaks, speckles and patches in multiple shades. No two granite slab can be exactly the same; hence very unique. It can be creatively used to bring a natural yet stylish grace to your interior spaces. 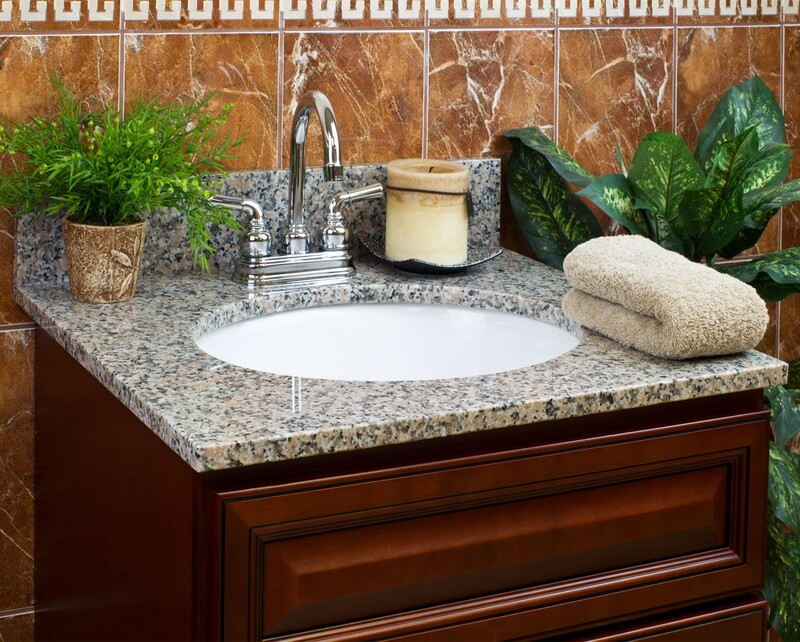 A few pros and cons of granite bathroom vanity top are further discussed. Easy Maintenance: Similar to marble, granite can be easily cleaned, just by wiping off spills from its surface using a soft wet cloth and mild detergent solution. Strength and Durability: It is probably the most durable of all stones. It is very dense and pretty strong as well. Moreover, it has a natural resistant to stains and scratches to a greater extent. All these qualities make it a perfect choice for bathroom countertops. Extreme Resistance to Heat: It is easily withstand high temperatures without being damaged, hence a popular choice for bathrooms and kitchen countertops. Wide Cost Range: Often considered as costlier than marble, granite still has several variants that are even cheaper than marble. So, you can easily choose granite as per your budget and requirement. Versatility in Functionality: Owing to its durability, strength and resistant nature, it can be confidently installed in other sections of your home or even outside. Porosity: Similar to marble, granite is also porous, but relatively less. Granite easily absorbs acidic substances, liquids and cosmetics, which can bring stains to its surface. Since these stains are tough to remove and may cause damage to granite, it is recommended to immediately remove such spills that could become a reason for stains in future. High-Cost: The distinguishing qualities of granite come with a high price tag. You have to spend a decent amount to adorn your interior spaces with stunning shades of granite. Not Completely Resistant: Though it’s the most resistant of all stones, it is still prone to stains and scratches. Chipping and etching can also occur if the granite vanity top is not handled with care. Note: To make your granite or marble vanity tops resistant to stains and scratches and also non-porous, it is suggested to seal it periodically. Always use a marble- or granite-specific sealer to protect your marble or granite vanity top, respectively. With the above discussion, you are now probably in a more informed situation. This comparison would definitely guide you through the process of selection of bathroom vanity top granite or marble material, and will help you make smart choices with respect to your aesthetic and functional requirements.